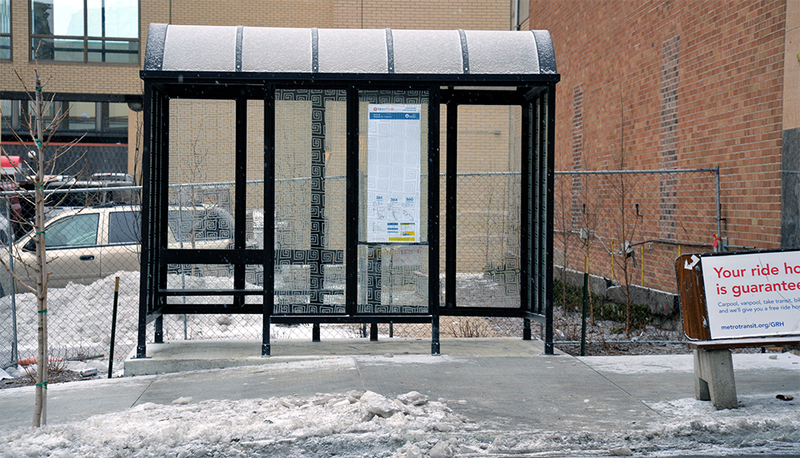 A new waiting shelter was recently installed outside the old Pioneer Press Building, part of a broader and continued effort to improve waiting facilities across downtown St. Paul. The new shelter is located on 5th Street between Cedar and Wabasha streets. The busy boarding stop had previously been without a shelter, in part because it’s located on a hill with a narrow sidewalk. Bus stop improvements were incorporated into the redevelopment of the St. Paul newspaper’s former headquarters into nearly 150 apartments for low- and middle-income earners. The developer, St. Paul-based Real Estate Equities, allowed Metro Transit to place the shelter on private property and incorporated its design into the redevelopment project. The sidewalk was also widened. A $250,000 Metropolitan Council grant helped cover site preparation and other improvements to the public space around the building. The apartment building is expected to open later this year. Plans call for new and replacement shelters to be installed at six other locations through 2022. The future improvements are being led by Metro Transit in coordination with the City of St. Paul, MnDOT and the community. In 2015, Metro Transit installed new shelters with real time signs, security features and other amenities at three of downtown St. Paul’s busiest boarding locations.